The Many Mini-Adventures of the Wards: We heart Meatballs! 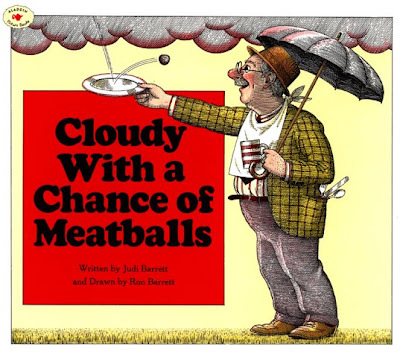 We've read this book over and over at our house (Cloudy With a Chance of Meatballs by Judi & Ron Barrett) - not because we knew they'd be making a movie out of it, but because it's our FAVORITE story! In fact, it's sitting on the nightstand next to my be right now! This book has been floating around our house for years now and the kids just love the imagination involved. They relish in the thought of food falling from the sky. Clouds of rolling hamburgers and giant doughnuts - who wouldn't love to take a bite out of either of those delicious treats?! The twisty tomato tornado page at the end of the book is their favorite part. We were so excited when we saw that a movie was going to be coming out based on this book. And when I say "we were excited" I mean, Jeremy and I were excited because we knew the kids would be thrilled to see their favorite book come to life on the big screen. We took the kids to see this movie last weekend for a fun family outing. All the way there Logan desperately tried to convince us that we would get our own softball size meatball upon entering the theater. He was in the spirit of oversized food already! He had Trevor convinced for a minute or so, but then finally fessed up when daddy pressed him a bit. Sadly no, we wouldn't get that giant meatball, but we would get 3D glasses! The kids were entertained the entire time - including Jackson. He wore the glasses for the first 3/4 of the show then took them off and preferred to watch the blurry 3D without them. The plot was fine, the characters enjoyable, and the animation was great of course. It was visually fun to watch, but as always, we all decided that we like the book better than the movie. We did love seeing the different scenes from the book make their appearance on the screen and had fun recognizing familiar pictures from the book. They loved that jello mold scene the best. Overall we give it 4 enormous gummy bears out of 5. It was really good, but not as great as we wanted it to be (our expectations may have been set too high). 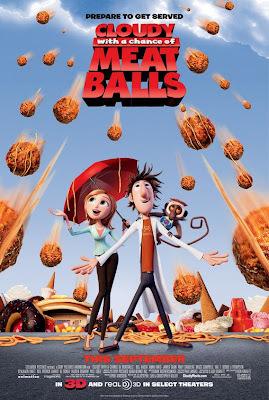 This movie is great for families young and old. You will love the visual feast!